"and every spirit that does not confess that[a] Jesus Christ has come in the flesh is not of God. And this is the spirit of the Antichrist, which you have heard was coming, and is now already in the world." We know this post seems off-topic, but if readers indulge us it will make sense shortly. A complete nonentity, whose name, during the brief period of his administration, evoked horror throughout the entire country and entered history in the word "Ezhovshchina" [a curiously bland term, perhaps "the Yezhov thing" --HSC]. He was raised to power by Stalin for the specific purpose of setting up a bloodbath. In the Soviet press, he was called the "Iron Commissar," but among the people he was named the "bloody dwarf." [Ezhov was only 154 cm tall, about 5'1". Two other famous Russians of comparably short height were Nikita Khrushchev and Alexander Pushkin --HSC] According to those who knew him well, toward the end of his administration, he was totally dependent on narcotics. 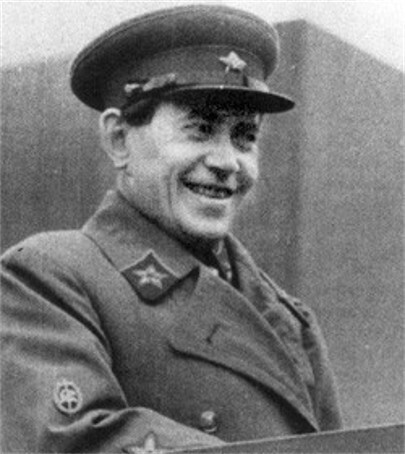 Yeshov later fell from grace (hard), which was its own story, but for our purposes it's important to remember that he was Stalin's chosen agent for digging up dirt on enemies of the state.